Update December 9, 2016: Not yet in on Warhammer? It’s now quite cheap. Well, would you look at that. As well as a bunch of free stuff and some new DLC, Total War: Warhammer’s as cheap on Steam as it ever has been. If you like your games with plenty of scheming, check out the best strategy games on PC. Live for just over the next 24 hours, the deal discounts Creative Assembly’s fantasy fun-time to £29.99/$44.99/€44.99. That’s 25% off. Grab it on Steam. DLC is sadly still full price, the new Wood Elves setting you back £13.99/$18.99/€17.49, as does the slightly older Beastmen campaign and race. Other lord-based tidbits will run you £5.99/$7.99/€7.49, while some grosser animations go for £1.99/$2.99/€2.49. It’s all even available on OSX these days. 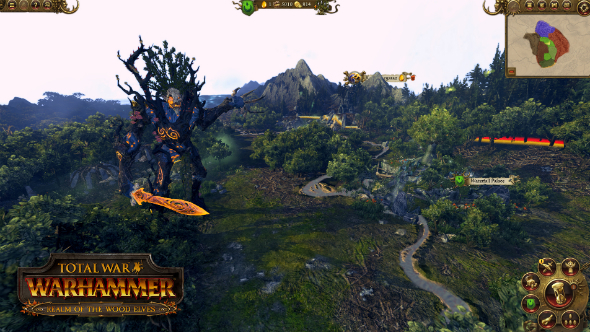 Original story December 8, 2016:Forget rushing to your calendar for a tiny, misshapen chocolate, today’s advent treat is the release of the Realm of the Wood Elves DLC for Total War: Warhammer. You know, because nothing says Christmas like stamping Dwarves to death as a giant tree. To mark the occasion Creative Assembly have released a new gameplay trailer that sums up what you’ll be doing as the Wood Elves, from their new currency to the race’s Grand Campaign. There are also some festive freebies coming to all players in the form of two new heroes, as well as a new Legendary Lord – Morghur the Shadowgave – and flying unit – Vicious Harpies – for owners of the Call of the Beastmen DLC. The two new free heroes are the Jade Wizard and Grey Wizard, who utilise the Lores of Life and Shadow respectively. 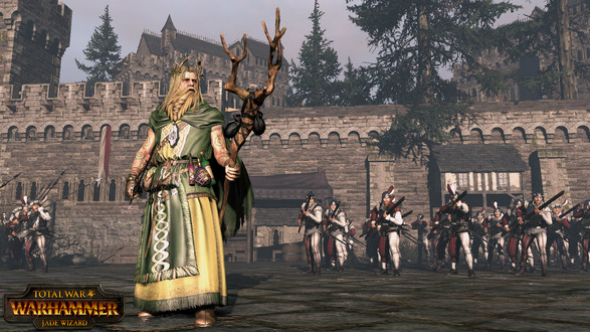 All of these additional units will unlock alongside the Realm of the Wood Elves DLC. So whether you’ve just got the base game, or dabbled in its DLC with Call of the Beastmen, there’s good reason to jump back in today.